We are extremely grateful to all at Casey’s Centra, Castlebar for all their fundraising efforts on behalf of Rock Rose House. 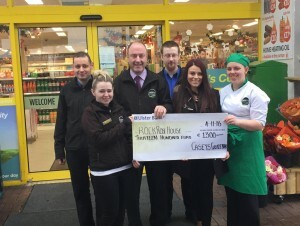 Pictured here are members of the Management and staff presenting Trisha Greavy, General Manager at Rock Rose House, with a cheque for €1,300.00 proceeds from their Coffee Morning and Raffle held recently. Thank you all.